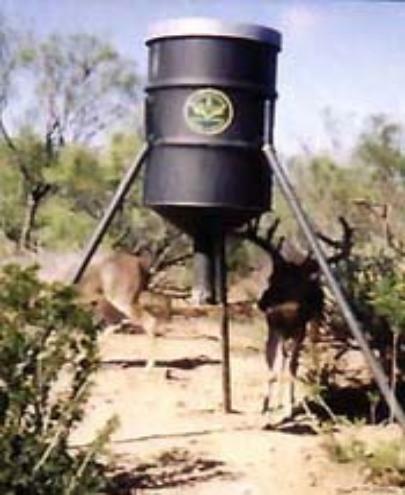 South Texas Tripods and Feeders, Inc.
South Texas Tripods & Feeders, Inc. 400# capacity Free Choice Supplemental Protein / Corn Feeder offers the wildlife management a reliable , trouble free system to dispense pellets with a minimum of feed loss. 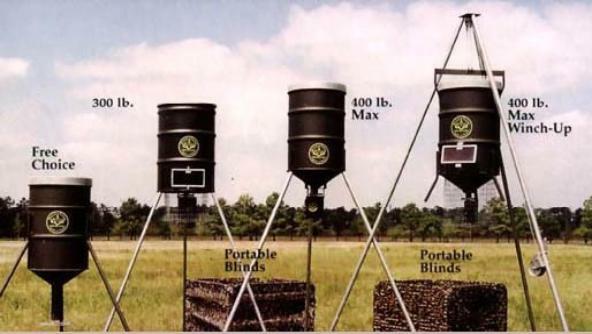 With it's exclusive 10" perforated feed distribution plate, this design allows rain to drop through the plate more quickly without it wicking up the funnel spout, thereby clogging the feeder. 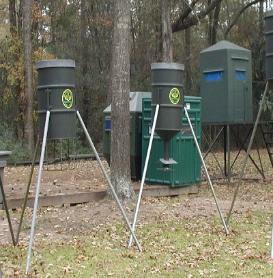 The feeder is raccoon and feral hog resistant with the 6'6" legs that place the feed plate approximately 38" off the ground. (Research completed by Texas A&M University Kingsville and reported in the Caesar Klieburg Wildlife Research Institute annual report 1994-95 pg. 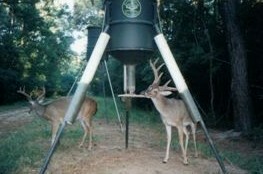 33) Then with the optional PVC leg guards, rodents can also be prevented from climbing the legs. 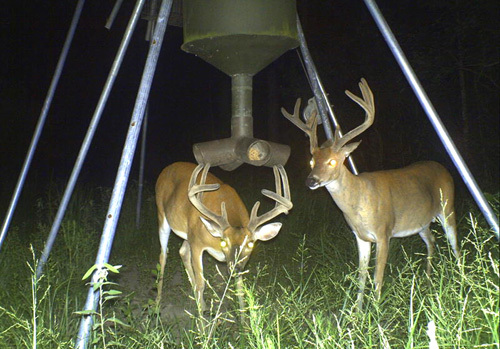 A more recent research project at CKWRI by Marc Bartoskewitz found that mature bucks especially benefit from high-protein supplement feeding program. 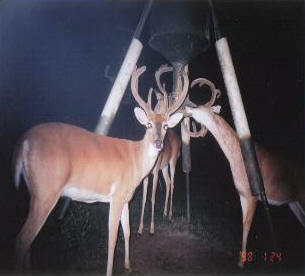 He reported highest deer use when feeder densities were _> 1 feeder to every 400 acres. 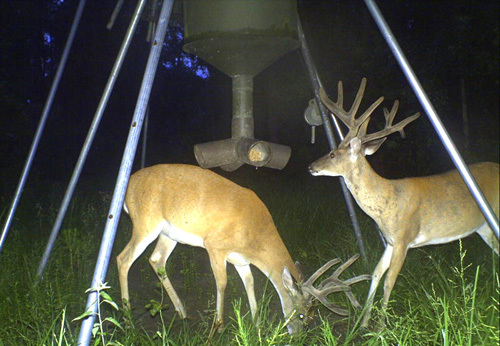 This nutrition solution system simply allows deer to eat the large quantities of high protein nutrients necessary to develop into trophy class animals. Being a U.S. 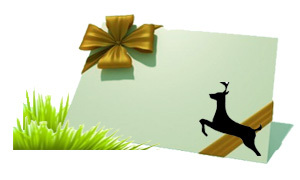 Distributor for Deer - Cam Scouting Camera, the Deer Cam was used to drive the point home, Nutrition= "s Trophy Class Animals' , with very little effort! 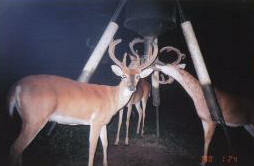 Notice the quality animals, pictured after 'Protein Nutrients are introduced to their diet!. 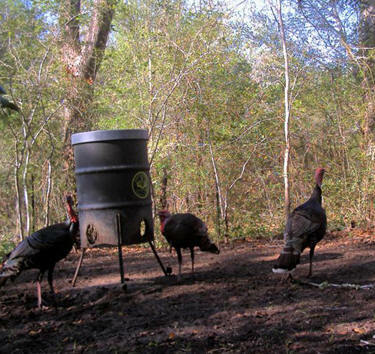 Does feeding protein payoff ??? Judge for yourself. 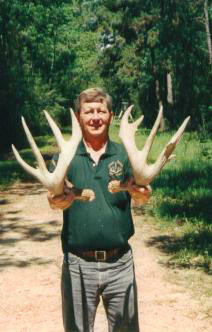 Over 200 B/C score sheds from a ranch using our protein feeders. 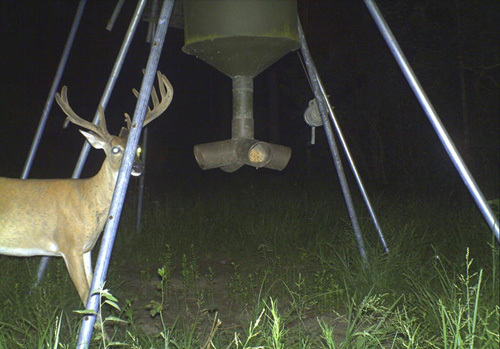 Chuck Cashdollar has been studying Deer and their habits and implementing this work into the developmentation of the Free Choice Feeders for 30 years. 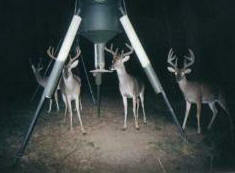 South Texas Tripods & Feeders, Inc. Introduces the 400 lb.